Of course to work up speed, you need to have a large shorthand vocabulary ready. You will need to learn a lot of words in shorthand that you can immediately write in shorthand. No, you cannot memorize every word in shorthand. So what do you do? greggshorthand.proboards.com/thread/121/word-dictation?page=1&scrollTo=4019 (when you don't know a word while taking dictation). These suggestions were in a Gregg Writer from someone who was at 160 and wanted to move up to 200 wpm. The writer noticed that accuracy and knowledge was holding him back from getting more speed. This was the plan of action (some variation form me since it was older and pre-anniversary writing). Leave speed alone until acquired a good habit of writing. Enlarge writing vocabulary. Work on word beginnings and endings and theory so when unfamiliar words are dictated they are easy to form with proper outlines. Copy from well written shorthand. Textbooks, etc. Write a number of lines any word, phrase or series of words which you cannot execute with facility. Practice on phrase, abbreviations, and brief form letters and articles to have these memorized. Do these at a good speed, but not too high a speed to prevent good outlines. Devote a few minutes everyday to drills on troublesome words. This is to increase control of the hand. Transcribe at least one take once a week (more if you need to). Work up to doing this at the highest speed with the best accuracy. This was in the Gregg Writer . This was in regard to transcription and typing (and the typewriters where you have to use an actual eraser to erase errors--prior to White Out being invented). However, I think this could apply to shorthand writing as well. Especially when it comes to speed. Write everyday. Find times you can use shorthand. Pull out a notebook instead of your phone or tablet to make notes or lists. Start a handwritten journal in shorthand and write in it each day. If you find that you are stuck at a certain speed, you may need to stop and just work on writing shorthand. Copy some pages from the beginner's manual to review some of the outlines and how they are written. Another shorthand book from a different system had a suggestion. This was prior to recording devices or having someone else present. This would work if you just want to practice without recording anything. It suggested to write a short sentence. Then write it and rewrite it hundreds of times. 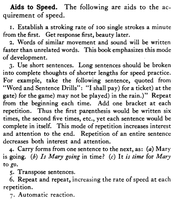 I would suggestion doing something similar to the Dictation for Speed idea. -Write the short sentence exactly as it should be in Gregg Shorthand. -Then write it a few more times, making sure the outlines are accurate. Memorize this sentence and the outlines (this is why it's a short sentence). -Write it several times quickly, as fast as you can. Yes you will sacrifice accuracy, but just write it fast. When just writing it from memory you should be able to write the entire outline. -Write it slow several times, gaining back accuracy. -Write the outlines that gave you trouble when you wrote fast. I'm thinking I put this somewhere, but it works here as well. Talks about scrutinizing your notes and daily practice of words and word combinations. 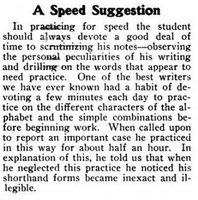 From my 1950 book "Your first year of teaching shorthand and transcription" it says. "The slow but accurate student in stenography is the rare exception rather than the rule. Usually the rapid writers and the rapid transcribers are the accurate ones." So as you build your speed, your accuracy will follow. From an old shorthand book (no Gregg) on internet archive). Had a good point on speed. I changed a few words (they used the word 'frase' instead of 'phrase') and writing of it. Make frequent and thorough reviews, always aiming and working industriously and energetically for grater perfection of form and higher speed. Your main, if not sole reliance for increased speed must be upon a more rapid manipulation, rather than further shortening of words and phrase forms. This movement can be gained only through such perfect familiarity with the word and phrase forms that they can be written with the utmost confidence and quickness, all of which is the result of much diligent and persistent practice from dictation, especially of words and phrases which fix the principles in the mind. Write your brief forms and phrases with a reasonable degree of brevity, but do not loose legibility. Use easily made forms and STICK TO THEM. Don't change. Frequent changes in word and phrases are fatal to a high rate of speed. No one can write rapidly while constantly experimenting and changing brief forms and phrases used. A long and even awkward form, well mastered and constantly used will be much more readily and quickly written than a shorter form imperfectly mastered. From the book Teaching Gregg Shorthand by the Analytical Method. 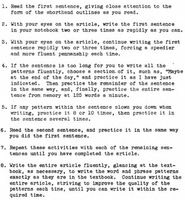 This has a few other pointers then just the shorthand writer (stenographer) working up speed. I would suggest working on those items before you get a second wind. You don't need to find someone to dictate to you today. You have many opportunities for something to listen to. In fact, it might be hard to find a quiet spot where there is no words being spoken (or sung). This book for teachers had a suggestion for students to copy from a textbook without looking at their hand (sort of like touch typing). Page 20 had an idea to gain speed and master writing outlines. If you try this, remember that when you don't look at your notebook, your shorthand outlines may be all over the page. On a line, above a line, etc. The sentences may even be written up or down on your notebook. That is to be expected. You're trying to just write the outlines exactly like the textbook. As you gain experience in this technique, your outlines will be more precise. FYI: "patterns" refer to how the outline is written. Then the same content would be dictated to the student. This allowed the student to just about memorize the way the outline is supposed to be written. For homework, the student would read the textbook, the same content. Yes, it would be memorized, but looking at the outlines would place them firmly in the mind.